Frankly, there are times when watching Anvil! The Story of Anvil that the whole thing seems like an elaborate joke, and that Christopher Guest will step in at any moment wearing a comedy moustache to announce that the game is up. Yet once one gets over the many obvious parallels the documentary has with This is Spinal Tap (1984), what emerges is not only a hilarious film in its own right, but so too a surprisingly touching one; sometimes a little sad, but also uplifting and genuinely inspiring. Anvil the band emerged in the early 80s speed/thrash metal explosion alongside the likes of Metallica and Slayer, and as the film opens we see footage of them from this period as they stand on the brink of global superstardom. Talking heads from the likes of Slash and Lars Ulrich tell us what an influence the band were in their bands’ respective formative years, yet flash forward to the present, and who has ever heard of them? It turns out that fame never materialised for the Toronto combo, and now lead singer Steve ‘Lips’ Kudlow is living in suburbia, forging a living out of delivering meals to schools whilst still playing gigs under the same monicker with long-time drummer Robb Reiner. In the meantime, band members have come and gone (none lost to bizarre gardening accidents, it appears), twelve albums have been released and largely ignored, and instead of filling stadiums like their former peers they play in poky venues populated by mere handfuls of loyal devotees. Lips places the blame on bad management over the years, though a listen to some of their terrible songs reveals that perhaps the quality of their material also played a part in their lack of success. Lips’ and Reiner’s familes and friends are by turns supportive of them and too a little weary of their continued persistence in chasing their rock n’ roll dreams. Things, though, begin to look up when an email arrives from a lady in Europe telling them she can book the band a multi-date tour of the continent, an offer which they eagerly take her up on. Any thoughts that this could be the band’s big break are, however, brought down to earth pretty quickly; tour manager Tiziana, whilst not lacking in enthusiasm and passion, appears bereft of organizational skills, and after a series of disasters, they limp home having once again failed to make an impact. Will their new album, This is Thirteen, ever get recorded? All along the way of this journey, the 500lb elephant just out of shot is, inevitably, Spinal Tap. The odd coincidence of the namesake Robb Reiner (note the extra ‘b’) aside, director Sacha Gervasi – and one suspects the band too – is clearly eager to play up the parallels: the childish song lyrics, terrible album covers and names, the artistic pretentions of band members, amplifiers going all the way to 11, even a tongue-in-cheek visit to the full-sized Stonehenge. Perhaps the comparison to the legendary Tap is one which flatters the band themselves? There are countless outrageously funny moments, and the comedic tone is thankfully not mocking; Gervasi, it turns out, was himself a roadie for the band, and it always feels like he is doing no more than administering them a well-intentioned gentle ribbing. However, that the climb to rock n’ roll stardom is often a torturous, pitfall-laden one will not come as news to anyone; what makes the story of Anvil so engaging is the men themselves, and the strong if sometimes fractious bond between them. Lips, for all of his years, still comes across as a wildly enthusiastic teenager, Reiner the marginally more worldly cynic, Sancho Panza to Lips’ Quixote. As things pile up, the strain on them sometimes boils over, but their fights and eventual reconciliations only illustrate the strength of feeling they have for each other: far beyond a professional relationship, beyond even a fraternal one. What is stirring is not just the two men’s relationship to each other, but how this unit continues to soldier on regardless of the nearly three decades of rejections and failures. Though they are portrayed largely as comical figures, their steadfast refusal to give up, especially as now old men in a young man’s business, and with near-Panglossian optimism, comes across not as foolhardy but curiously inspirational. For many another musician’s supposed anti-establishment posturing, here are two men delivering a two-fingered salute to their doubters and detractors. The most poignant section of the film comes when Anvil are booked to play at a Swedish rock festival, where backstage Lips comes face to face with bands he played alongside years before. What is sad is seeing the disparity between the aged, jaded veterans of those multi-million selling bands, and the way their contemporary Lips eagerly runs up to them to shake their hands, like a teenage fan meeting his idols; few though can remember the face from the past. Had things been a little different, had luck fallen on Anvil instead of the Scorpions, perhaps their roles might have been reversed; instead, they have lived the life repeatedly denied to Lips and Reiner. There are many thematic similarities to Darren Aronofsky’s superb The Wrestler (2008). But while that film was fascinating on a technicial, cerebral and emotional level, there is nothing as comparitively original with what Gervasi does with the material here; he is simply introducing us to his heroes. 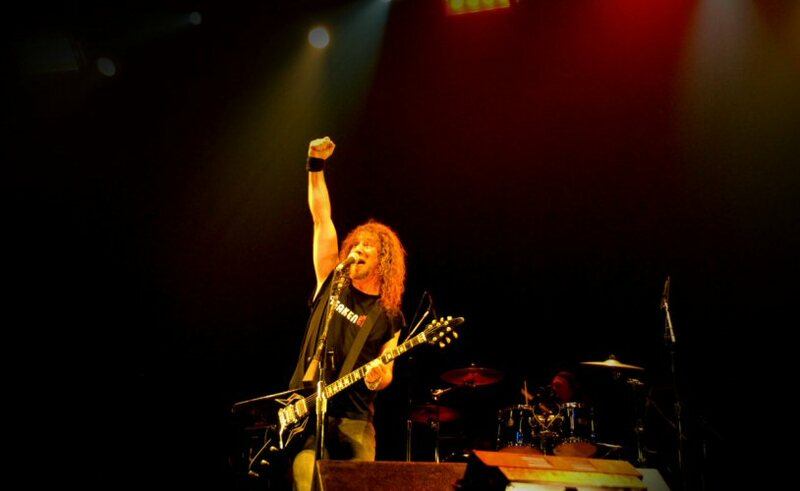 However, that their story makes for such a genuinely funny, moving and inspiring film speaks volumes about the sheer likeability of its stars and the strength they find in each other to carry on doing what they love, and despite the shortcomings of their music it is impossible not to wish to see Anvil succeed after all those years of trying.